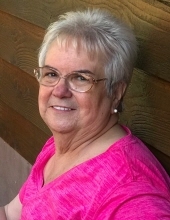 Barbara "Bobbie" Burgett Goodson, age 72, of Hazard, KY passed away on March 24, 2019 at the Greg and Noreen Wells Hospice Care Center. Barbara was a member of the Ira Combs Baptist Church. She loved to travel and enjoyed going to the farm and camping. She was the daughter of the late Osie Burgett and the late Agnes Combs Burgett. She is also preceded in death by one sister: Doris Jean Cornett. To send flowers or a remembrance gift to the family of Barbara "Bobbie" Goodson, please visit our Tribute Store. "Email Address" would like to share the life celebration of Barbara "Bobbie" Goodson. Click on the "link" to go to share a favorite memory or leave a condolence message for the family.